LeBas was born in 1963 into an Irish traveller family. He has made drawings compulsively since childhood, and after being encouraged to go to art school, he studied textiles at the Royal College of Art in London. 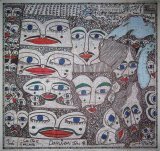 LeBas has continued to make drawings in pencil and oil pastel - often intensely autobiographical, sometimes using Romany dialect - and these have been included in exhibitions of Outsider Art in Britain, America, Japan, Sweden and Ireland. His recent drawings have 'explored the claustrophobia experienced by nomads in modern European society by mixing cartography with an idiosyncratic tribal portraiture'. Works by LeBas were included in the exhibition Obsessive Visions: Art Outside the Mainstream at England & Co, and he was represented in the Prague Biennale 3 and in the Roma Pavilion at the Venice Biennale in 2007.